Danbury MINT Shirley Temple Toddler Doll "sunday Best"
These are two Danbury Mint Shirley Temple dolls both in good shape, duck dress could use a little cleaning, other than that they look fine. THEY both have their hats too. Gloria Vanderbilt Danbury Mint Spring Bride of The Four SeasonsCollection. Gorgeous Bride In Full Bridal Attire! New ListingDanbury Mint John Deere "Johnny" Porcelain Doll 16"
From the Dolls of the Silver Screen Collection. SHIRLEY TEMPLE SUNDAY BEST DANBURY MINT DOLL FROM TODDLER COLLECTION w/ BOX . Condition is New Please review the pictures carefully. Doll is mint never been out of the box. Danbury Mint By Rustie Sahara Princess Of The Desert Porcelain Doll. Condition is good! Kept in good shape by a true collector! Little Princess is a beautifully detailed porcelain doll. Shirley Temple was an actress that was loved for many years! She is approx. She does have her crown and scepter as they are usually lost with most collections. 1998 Shirley Temple and Her Doll Danbury Mint Two of a Kind Doll Collection. Condition is Used. Never played with..kept on my curio cabinet away from dust and sunlight. Relisted due to buyer canceled. Princess Diana Royal Wardrobe Collection- Danbury Mint. Condition is New. One Green/Blue Sailor Suit. New in box. "1986" PRINCESS DIANA BRIDE DOLL DANBURY MINT Complete With Box & COA. Excellent shape including everything original and all documentation along with original receipt! Shipped with USPS Priority Mail. Danbury Mint. The Shirley Temple. Dress Up Doll. "Our Little Girl". New in Box. The jacket is accented with large white buttons and wide white piping. Up for sale is a red and white polka dot suit that Princess Diana wore on 1983 Australian Tour. It is one of the Royal Wardrobe Collection produced by Danbury Mint. When it rains, it pours.this Morton Salt porcelain doll designed by Nancy Leslie and produced by the Danbury Mint is adorable. She carries a Morton Salt tub and a blue and yellow umbrella. This doll is in very nice, displayed condition. Shirley Temple Doll with 22 outfits in original boxes Danbury Mint. Shirley Temple Doll with 22 outfits in original boxes Danbury Mint. Condition is Used. Most of the outfits have never been touched and are still in the plastic within the original boxes. Shipped with USPS Priority Mail. MADE IN GERMANY. MADE OF MOLDED RUBBER BEAUTIFULLY HAND PAINTED. Included is a copy of the ad for Diana from the Danbury Mint, also the COA, and doll box. Diana has her bridal bouquet, tiara, and doll stand. No problems at all. Diana is in excellent condition and stands approx. Danbury Mint Aviator Pilot Tommy Doll by Elke Hutchens w/ airplane and glasses . Condition is New. Shipped with USPS Priority Mail. Danbury Mint Shirley Temple "Captain January" Doll. New in box. 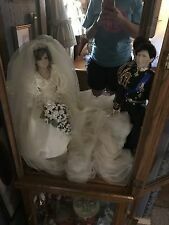 princess diana doll danbury mint and clothes. Condition is Used. Shipped with UPS Ground. Very good condition. WE DO NOT PUT LOWER VALUES ON CUSTOM FORMS. Michelle Obama Inaugural Ball Porcelain Doll Danbury Mint 16" Tall. Condition is New but has no box. Shipped with USPS Priority Mail. Adorable collectible Shirley Temple Doll by Danbury Mint1996. Only marked used because it had another owner. It sat on a shelf and never played with. Pristine Condition. Porcelain Head, arms and legs. SHIRLEY TEMPLE "STAND UP AND CHEER". DOLLS OF THE SILVER SCREEN. 14" MADE OF IMPORTED BISQUE & PORCELAIN. Collectable Hand Painted Doll. Accessories Include Porcelain Dog, Sunglasses, Beach Ball, and Beach Towel. Condition is New. Box Has a Few Minor Blemishes but The Doll and Accessories Are in Perfect Condition. Shirley Temple Danbury Mint Doll Clothes. Condition is Used. Shipped with USPS First Class Package. You are bidding on a Darling Little Shirley doll by the Danbury Mint. 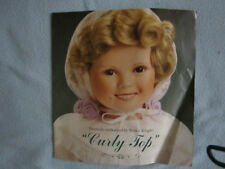 This is a potrait doll that depicts shirley temple at the age of 18 months. It was sculpted by the artist Elke Hutchens. It has been removed from the box to take pictures but other than that it has been stored in the original packaging. The box does have a ripped area on the back side. Please see pictures. By Susan Wakeen. The Danbury Mint "Caitlin" the Coca Cola collector doll n.
danbury mint little one by susan wakeen 18" new never removed from box . Condition is New. Shipped with USPS Priority Mail. Mint Brandon, The Boy Scout Collector Doll ~ Danbury Mint ~ 2003. Condition is New. Shipped with USPS Priority Mail. She does not have any paperwork.